Amazon CEO Jeff Bezos is probably not a happy man today, with the company reporting disappointing fourth quarter 2011 earnings , including a dramatic 58% decline in net income. Many analysts were unsure where Amazon would stand this past quarter with the launch of the much-hyped US$199 Kindle Fire tablet. The device wasn’t expected to be immediately profitable for Amazon, but the company expected people to purchase media for their devices and was counting on those book, music, movie, and TV sales to make up for it. 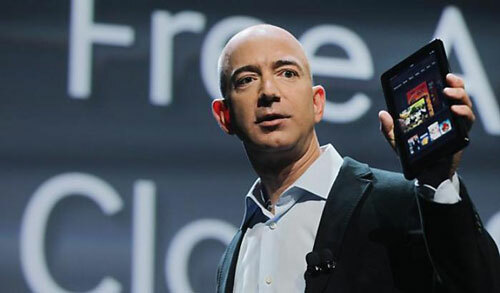 One analyst predicted Amazon sold 6m Kindle Fire devices this quarter, but Amazon would not say how many units were sold. From a revenue standpoint, the company did fairly well with $17,4bn in sales — a 35% increase from the year-ago period. But the company missed wide on profits, with net income decreasing 58% to $177m, or $0,38 per diluted share, compared with net income of $416m, or $0,91 per diluted share, a year ago. Operating income was $260m in Q4, compared with $474m in the year-ago period. Unfortunately, even the revenues did not meet steep Wall Street expectations of $18,3bn, according to estimates from FactSet Research. Amazon’s stock price in after-hours trading reflected the disappointment. With the rumblings from Amazon about the early success of its new Kindle Fire over the holiday season, the company’s disappointing fourth quarter results came as a surprise. More surprising was Amazon’s silence regarding total Kindle Fire sales for the quarter. During the earnings call, Amazon’s executive team deferred questions about the device to the press release, which simply regurgitated sales data from December. The Kindle Fire, which is Amazon’s 7-inch Android-based tablet device, did phenomenally well during its initial launch in November. The company reported selling at least 3m Kindle readers (including the Fire and Amazon’s other e-ink readers) three weeks after the launch — or about a million devices per week over the 2011 holiday shopping season. While the Kindle Fire’s initial spike in sales could be attributed to its relatively low $200 price and the proximity of its launch to the largest shopping “holiday” of the year, it’s possible that Amazon saw a sharp decline in the following weeks. Essentially, that means Amazon may not have sold as many devices as it projected, which would explain the company’s silence during the earnings call. Another explanation for why Amazon didn’t mention Kindle Fire sales in its quarterly earnings report could have something to do with digital media sales. Unlike Apple and Samsung, Amazon is selling the Kindle Fire at a loss and making the money back on digital media sales and application purchases. Some analysts estimate that the company is making at least $136 in additional revenue from every customer who bought a Kindle Fire. If digital media sales are down for the quarter, it could reflect poorly on the Kindle Fire’s success.